Gov. Jim Doyle recently signed into law 2003 Wisconsin Act 130. Among other things, this bill creates a rebuttable presumption against awarding legal custody to a parent who has engaged in a pattern or serious incident of domestic abuse, requires a GAL and mediator to have training related to domestic violence and requires the GAL to investigate whether either party has engaged in domestic violence. Certainly, any legislation which would reduce the incidence of domestic violence is welcome. Still, one must ask whether the provisions of this law will truly have any effect, or merely serve as an opportunity for politicians to claim credit for taking action. Similarly, it is appropriate to examine whether the methodologies required by this legislation are well thought-out legally or are only politically motivated. The main focus of the litigation seems rather obvious. Where a pattern or serious incident of domestic abuse is present, the presumption should be against awarding the abusing parent custody. Wisely, this is a rebuttable presumption. As despicable a person and spouse an abuser may be, by creating a rebuttable presumption the legislation leaves the door open to the possibility that an abuser can still be an adequate parent. It should be kept in mind that, contrary to public perception (and, for that matter, the perception of many judges and lawyers), joint legal custody does not require parents to communicate or agree on decisions. Rather, it independently allows each of them to make major decisions. In many, if not the vast majority, of cases, this independent power is little more than symbolic as most major decisions, such as school and religion, are not in dispute in any event. Therefore, in the vast majority of cases, whether an abuser has legal custody or not would have no effect on preventing future abuse. The problematic part of the legislation lies in the additional responsibilities of the GAL. It appears that the proponents of the legislation either did not know the legal role of the GAL in Wisconsin or simply did not care. For one thing, the legislation requires the GAL to “report” on the existence of domestic abuse to the court. Many years ago, a supreme court decision included in the duties of a GAL to “consult” with the trial court. Some courts interpreted this to mean that there was permissible ex parte communication between the court and the GAL. Changes in the court rule on GAL duties (Wis. Stat. §767.045) and subsequent decisions have clearly defined the GAL role to be that of the lawyer representing the best interests of the child. As such, the GAL is treated the same as lawyers for the parties. See Gretchen Viney and Gregg Herman, “Protecting Children: The Critical Role of the Guardian Ad Litem in Family Court”, Wisconsin Journal of Family Law, January, 1994. Being a lawyer for a party is inconsistent with a duty to “report” to the court. How does the GAL report? Are the rules of evidence to be discarded? Is the GAL now an arm of the court rather than a lawyer for best interests? The legislation gives not a clue. However, these questions, while meaningless to the political process, are crucial to the legal one. Further, what investigation does the GAL need to undertake? If the GAL gets an negative answer when asking both parties if there has been any domestic abuse, has the GAL performed an adequate investigation? Given the reluctance of many victims to discuss their victimization, is this investigation likely to be meaningful? True, the legislation does require GAL training to include the dynamics and effects of domestic violence, but it is not clear how much of the mandatory training should be devoted to these issues. Does anyone in the legislature think that a few minutes of training would suffice to provide the skills an appropriate investigation requires? 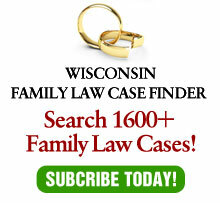 Given that Wisconsin law has long made the best interests of the child the primary concern of family courts, such a comment can be based only upon either a total lack of knowledge of Wisconsin law or, more likely, hyperbole to extract political points. Domestic violence is a serious problem in our society and the effect on children is of the highest degree of importance. It is too serious an issue to be used as a political football.